Evil Computers: When technology turns against us! Hired to rescue escaped inmates, a Florida man is framed for a Cuban gangster's assassination. Austin Police Detective Ben Simms searches for justice. 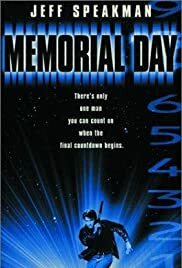 The film deals with Edward Downey (Jeff Speakman) , a government agent/ex-Marine imprisoned mental sanatorium where has strange dreams about his mentor (Bruce Weitz) . He's just been released from a mental ward by general Willard (Paul Mantee)and assign him to kill senator Lancaster(Frederick Coffin) and Presidency candidate . There's only one man you can count on when the final countdown begins. As an embittered satellite expert gets the opportunity for revenge against the USA by aiding terrorists in a plan to destroy the country's military base . A satellite called Eagle from 'Star wars project' is robbed by terrorist organization called 'Five Red' and formed by ex-KGB agents . The laser satellite launches a series of ray attacks on orbiting space station and US atomic underwater . Downey's needed to stop a terrorist band that's stolen the laser satellite . Meanwhile , he's helped by a beautiful journalist (Stephanie Niznik) . This routine-low budget movie contains suspense , action , thrills and cheesy effects specials . Routine , and low quality to the point of boring though some moment gets thrilling . The film is starred by Jeff Speakman . He's 6th degree black belt in American Kenpo Karate . Speakman is director of American Kenpo, an International Kenpo Karate organization with more of 50 schools . In the cinema his greatest success was 'Perfect weapon' but his career failed with C grade films (¨Hot Boyz¨, ¨Deadly outbreak¨) , like this one , becoming himself a failed star . Secondary cast is formed by usual B-movie actors such as Bruce Weitz , Frederick Coffin and Joe Stevez who holds an uncanny resemblance his brother Martin Sheen . The movie was middlingly directed by Worth Keeter . He's usually TV movies director (Power Rangers episodes) and occasionally cinema director , such as ¨Hijack¨ , ¨L.A Bounty¨ , ¨Trapper county war¨ and ¨Scorpio one¨ (again with Jeff Speakman and with similar plot and FX) . Rating : Below average , though displays some action but also boredom .